I do love Portugal but one of the biggest frustrations about cycling there is the lack of decent maps. Or, more frequently, the complete absence of maps of any sort! This is the river mouth location of Vila Nova de Milfontes – according to everyone except Google! Oh, plus a few other issues. Like inconsistent road numbering and highly erratic road signage. And that many maps are out of date. It also doesn’t help that asking for directions in Portuguese – and understanding the answer – is extremely difficult for anyone who doesn’t speak the language. All of which can make navigating your way around the country by bicycle a bit of a headache. So I wanted to share a couple of possible solutions here – and ask for any alternative suggestions. But, before I offer up my answers, a few more thoughts on the problems. The first time I rode through Portugal, I made the mistake of not buying a map in advance. Bad idea. In many Portuguese towns it’s hard to find anywhere selling anything other than really basic tourist maps. Luckily, I did find a copy of a 1:400,000 Michelin map of the whole of Portugal, which was… adequate. (Michelin also produce a couple of larger scale maps but, as far as I can tell, the detail is exactly the same just spread over a larger piece of paper). 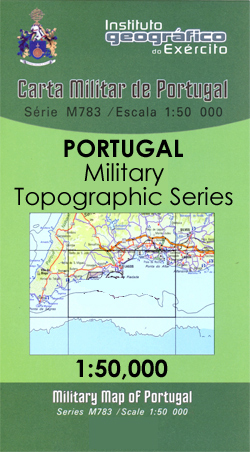 The only accurate maps of Portugal I’ve ever seen are a series of military maps – with contours – but: a) these are very large scale (1:50,000); b) few shops stock them; and c) they’re decades out of date. The last of the above points is a common problem. Thanks to European Union funding, Portugal has built lots of roads in recent years. Some old main roads have been upgraded to motorway standard and are now closed to cyclists, junctions have changed – and new roads have sliced across old ones. Unfortunately, few maps show all the new roads and the Portuguese are really, really bad at signposting routes for car drivers let alone for cyclists. Many roads also have various different designations and – just to further confuse matters – there’s more than one numbering system in existence. Anyway… there’s more on this subject on the Roads & Maps page but hopefully you get the idea. Navigating around Portugal can be a pain in the proverbial. In conclusion, the Michelin map is probably the best of a bad selection for touring cyclists but doesn’t show all the roads that exist – and as most cyclists want to be on quiet back roads this presents a problem. Alternatively, buy a road atlas that gives you the most detailed scale (probably of Spain and Portugal) then destroy the binding and just take the pages that cover your route! I’ve done this in several countries and it works out cheaper and lighter weight than buying lots of different maps – particularly as when on a long cycle tour you pretty much ride a line from one side of a map to the other. I’d also use Google as a check for this. One word of warning regarding Google Maps though. Apart from the fact that the ‘cycling’ route option doesn’t work in Portugal, Google also doesn’t always put towns in the right place! So just remember, Google Maps are great for plotting routes etc but do check. Personally, this is about as high-tech as I get. I don’t know if there are any other reliable mapping options. Anyone got any other suggestions? On the issue of maps for Portugal. I can say this is the same for other countries that I visited the last few year. I could not find any decent maps for cycling in Urugauy and on my last visit to Jamaica I was sold a crappy map for 15 Dollars designed by graphic artist in a hotel lobby. I am planning our trip cycling from Lisbon to Seville in 74 days time and I must agree the maps I have to depend on as well as maps on GPS is scary. I cannot find any good maps (Michelin included) in South Africa but somehow it makes the tour that more interesting. The only things that makes me scared is I am not alone and I have my wife (always the critic) and my daughter (at 16 – an even bigger critic) looking over my shoulder and depending on me for guidance. You have already commented on the distances being out after having had a look at my itinerary and I have relooked everything about 100 times and every time I get a new figure for the longer distances. But then – this is part of the trip that not many people acknowledge as being on the planning phase. If anyone has some great ideas on trustworthy maps for Portugal/Spain. Let me know.